Ferguson, Missouri, is once again in national headlines due to unfortunate circumstance. An amateur video reveals the exact moment two police officers were gunned down during a rally outside the Ferguson Police department. Protesters gathered outside the police station after the Police Chief of Ferguson announced he was stepping down from his position. The small group started to disperse around midnight when suddenly an ‘ambush‘ style assault took place, where a flurry of gun fire left two officers fallen and threw the city right back into chaos. 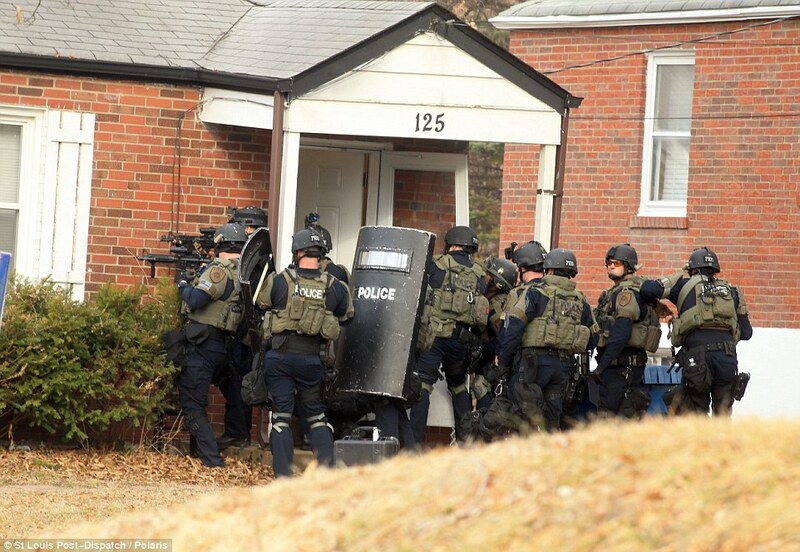 SWAT officers raid a private residence in Ferguson after a shooting that left two officers in serious condition. While the group of protesters have been peaceful, there has been no current release of record or statement on the people or person who fired the shots. Their identifies are not currently known and their connection to Ferguson is also not known. The parents of Michael Brown released a statement condemning the violent act toward law enforcement. Swat teams did descend upon a house and took three people for questioning. Attorney General Eric Holder called the assailant a ‘punk’ and said the act was ‘disgusting’. While both officers survived the shooting, they both remain in serious condition. One officer’s face visor was penetrated and the officer suffered a penetrative wound to the face.